We all want our cats to be happy and healthy throughout their lives, and it can be very difficult to see them slowing down as they age. 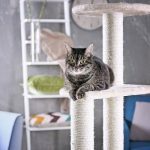 This is where buying and giving the best glucosamine for cats can help to restore your cat's mobility and keep them comfortable. Since there are so many supplements available from different manufacturers and in different forms, it can be hard to decide which one will work best for your cat. This is why we've rounded up the top five glucosamine supplements and reviewed them along with putting together a buyer's guide. Glucosamine is a supplement that you'll naturally find in your cat's joints and cartilage that helps to keep they strong and supple as your cat ages. A glucosamine supplement helps to reintroduce glucosamine into your cat's body because the natural levels tend to drop as your cat ages. It stimulates cartilage repair, reduces inflammation, and helps to strengthen and reform the existing cartilage in your cat's joints to help them move easier. In turn, it also helps to reduce the bone on bone rubbing that comes when your cat's cartilage breaks down. You can develop multiple joint disorders when they age, or they may develop one joint disorder that progresses to worse levels. Either way, your cat can start to show several symptoms that may concern you when you notice them. Stiffness - Your cat can display stiffness in their back legs, and this tends to get worse after they lay down for a few hours or try to go upstairs. This is due to their joints stiffening up from reduced circulation. Swollen Joints - Swelling and inflammation is very common when your cats have joints that rub together. This swelling can flare up and go down when it gets colder out, and it can also flare with more use if your cat gets more active. Lethargy and Weakness - Your cat's muscles can get weaker as they get more hesitant to use them due to increased pain. This can lead to lethargy that gets worse as your cat's disease progresses. Excessive Grooming - If something hurts on your cat, they tend to excessively groom the area in an attempt to alleviate the pain and discomfort. This can lead to hair loss around your cat's joints. Temperament - If your cat is in pain, their temperament will worsen in response to the pain. They could avoid being touched, hiss or scratch more, or just generally seem more unhappy. Hesitant to Move or Jump - If your cat has joint problems, moving around or jumping can cause it to hurt more. This can lead them to be very hesitant to move around much, and this is especially true when their problems get worse. Glucosamine and chondroitin are two common ingredients in most joint supplements, and glucosamine helps your cat's body absorb the chondroitin. When you combine them together, they're a more powerful formula that helps to ease your cat's joint symptoms. 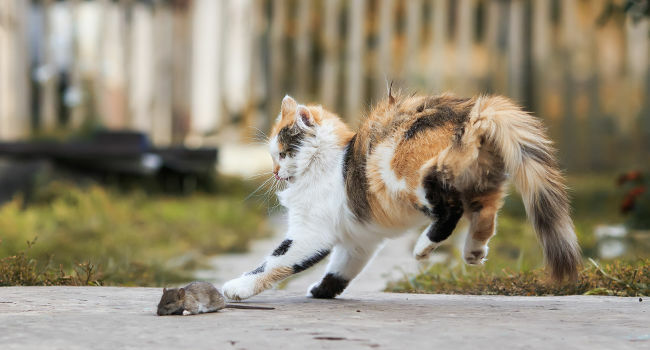 You can find glucosamine naturally in your cat's body, but the production levels tend to slow down as your cat ages. This is where you start to see joint problems like arthritis, and your cat's joints can get worse as the natural levels of glucosamine decrease even more. Once your cat's cartilage breaks down, your body will send inflammatory markers to the area that can result in swelling and pain. This further hinders your cat's natural healing process, and more damage can occur throughout their joints. Chondroitin is another natural compound that you find in your cat's joints that is a popular second ingredient in many glucosamine supplements. It helps your cat's joints retain water, and it also helps to provide shock absorption that cushions your cat's joints. Is Glucosamine Safe for Cats? Yes, glucosamine is safe for your cat, but it is possible to overdose your cat if you give them too much. Additionally, you want to avoid giving this to your cat if they have kidney or urinary stone issues because it can make it worse. Most glucosamine supplement dosage ranges between 120 milligrams up to 500 milligrams depending on your cat's weight and age. It may be best to start off on the lower end and work your way up. Fortunately, there are very few side effects of giving your cat a glucosamine supplement. You'll occasionally get diarrhea and vomiting when you first start your cat on the supplement, but these symptoms usually subside after a few days. Once your cat starts using this supplement, they have to use it for the rest of their lives for it to be effective. Also, it's important to realize that some cats will respond better than other cats, and some cats show results much sooner. The sprinkle formed tablets are easy to break open and dissolve in your cat's food to ensure that they eat it, and it features ingredients that help to restore cartilage to your cat's joints. Additionally, these supplements also protect the cartilage that is left in your cat's joints by lubricating them. Along with joint support, this supplement targets your cat's urinary system by strengthening the bladder's lining. You can also notice results in a little as two weeks, and this is great news for cat parents who have cats that have more advanced arthritis or joint issues. People who bought this joint supplement for their cat liked that the sprinkle tablets are easy to open and put in their cat's food. Cat parents did say that it may take up to a month before you start to see a difference in your cat. This gel supplement comes in five different formulas including hairball, hip and joint, uri-ease, pet-ease, and multi-vite that lets you chose the one that is best for your cat. This supplement comes packed in an easy squeeze tube that makes it easy to put in your cat's food. 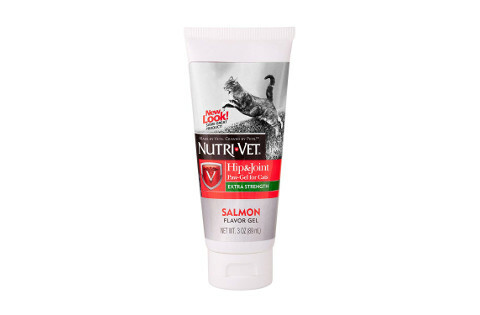 Each teaspoon of this gel features 10.5 milligrams of glucosamine that works to protect your cat's joints and prevent further deterioration. Both large and small cats can have this gel without any issues, and this gel comes in a thicker consistency that is easy to pour and mix into your cat's food. If your cat won't eat this gel, you can also apply a quarter of a teaspoon to their paw and let them either lick it off or soak through to get into their system. It contains no corn, soy, wheat, petroleum jelly, artificial flavoring, or artificial coloring for a healthier supplement. Cat parents who bought this gel supplement liked that they could give it to their cats a few different ways with the same end result. Cat parents did say that this gel has a stronger smell that tends to linger after they open it. These gelatin capsules are very easy to pull apart and sprinkle in your cat's food once or twice a day to feed it to them. 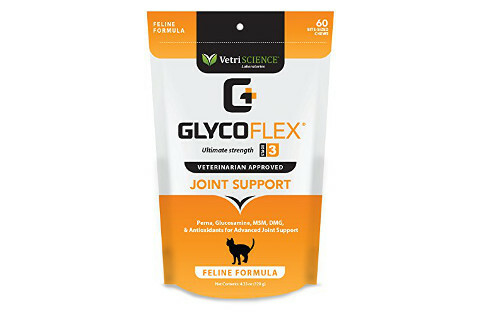 It comes packed with glucosamine and chondroitin to help protect and support your cat's joints as they age. The ingredients in these capsules help your cat's system adequately absorb the glucosamine and chondroitin each time they eat it, and this amplifies how well the supplement works for your cat. The granules don't dissolve in water or food, and this means that you can be sure that your cat gets the full dose when they eat it. The supplement can take a few weeks to work, but it can provide long-term relief for common joint problems and joint deterioration. This formula works to protect your cat's joints from further damage due to age, and this formula can also help to strengthen their existing joints for easier movement. Senior cat parents who purchased this supplement for their cats liked that it doesn't dissolve when they put it in their cat's food because they can see if their cat eats it all or not. Senior cat parents didn't like that it can take weeks or months for the supplements to work. This joint supplement has been around and in use for over three decades, and this supplement works to increase your cat's back leg strength and range of movement in as little as a month. The chicken liver flavor is very mild, and this flavor helps to attract your cat. The soft chews are easy for cats of all ages to eat and digest, and these chews are also easy enough to crumble up in your cat's food or treats. This supplement targets older and overweight cats that have additional stress on their joints and this supplement works to reverse this damage. Additionally, it works to protect your cat's joints from more damage due to stress or aging, and it contains a green lipped muscle called GlycOmega Perna that helps to reduce inflammation. Your cat will get 250 milligrams of glucosamine each time they eat one of these soft chewables. People who bought this supplement for their cat liked that it came in a soft and chewable form that was easy for their cats to eat. People who bought this supplement for their cat did say that it's a slightly drier option that tends to crumble. This bacon flavored formula comes in a thin consistency that allows you to squirt it over your cat's food once a day. You can safely use this formula for cats of all ages and sizes without worrying about it being too strong or causing complications. It comes formulated with a complex mixture of glucosamine, chondroitin, vitamins, and minerals to help support your cat's entire body and systems. This formula goes to work protecting your cat's joints while preventing further damage due to moving around and normal deterioration. You can store this formula at room temperature without any problems, and this formula comes in a convenient pump bottle that makes it very fast and easy to put over your cat's food. This is a human-grade remedy that is specially designed for long-term usage to give the best results possible for your cat. Pet parents who purchased this item for their cat liked that it comes in two different flavors and that they get a convenient pump format. Pet parents didn't like that it could leave an oily residue when they used it. What's the Best Glucosamine for Cats? 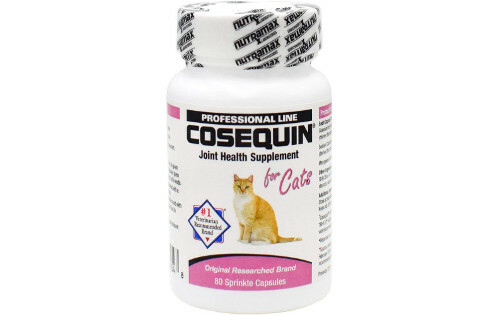 Our pick for the best glucosamine for cats is Cosequin for Cats because it's very easy and convenient to crack the capsules open and mix it in with your cat's food. You also get 80 capsules per order, and this amount of capsules is good enough for almost three months of supplement usage. We were also happy that this supplement protected joints, but it also worked to restore cartilage that may have worn away over time. Finally, it also works to strengthen your cat's urinary system along with their joints when they take it.